You’ve blasted out the first draft draft of your novel and have patted yourself on the back for a job well done. But is it done? Looming large is the abyss known as revisions. 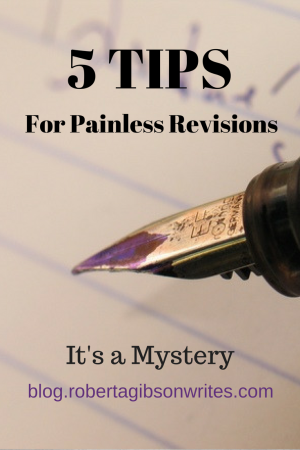 Here are five tips for getting the most out of revisions as painlessly as possible. Get fresh eyes on your project. Although writing a novel is perceived as a solo enterprise, realistically you should have a support network of experts and fellow writers to give you feedback and make your novel shine. Look for reading and writing groups through libraries, bookstores, writing societies, and online networks like Meetup. Friends and family may be convenient readers, but ask them for help only if they have the expertise to make your writing better. If you are the type of writer who slaves over every word, critiques can be difficult at first. Remember that you don’t have to make every change, but if you are open to suggestions, people will be more willing to offer their honest opinions in the future. Provide paper copies, if possible, so less vocal readers can mark your work with comments to be read in private. Another benefit of participating in a writing group is that you get experience reading your work in front of an audience. 2. Make sure each chapter ends with some tension. Imagine your reader is comfortable in bed reading your book. Your reader says, “I’ll just read to the end of this chapter and then I’ll turn out the light.” If you ramp up the tension or suspense at the end of the chapter, you will entice your reader to move on to see what happens. Sometimes leaving a question unanswered is enough to get the pages turning. Once you start having others critique your work, you may find you have quirks or issues that pop up again and again in your writing. For example, in my case I use “I think,” “He decided,” and other thought verbs too often. What I write: I think I’ll go to the store. She decided to go to the store. Much stronger: I went to the store. She ran to the store. Another writing trap is to use the same descriptions again and again. “She shrugged, he nodded, he wrinkled his nose.” Use “find” to get an idea how often you use a given phrase and decide if you need to generate some fresh ones. Once you locate the offending words, rewrite the sentences to make them stronger. Do this again on the finished draft to make sure your personal quirks haven’t slipped back in. I recently had the opportunity to meet with a wonderful writer who shared his techniques for making his scene descriptions specific and clear. Rather than simply visualizing events in his head, he actually stood up and acted them out. For example, character A meets character B, who is much younger and has her eyes on her cell phone. How does character A get character B’s attention? The written description of the actions became more realistic with a little play acting. Enlist friends and family to play charades with some of your trickier scenes and see how they work. 5. Have your computer read your novel to you. As a final step, if your software has a speaking or reading function, have your computer read your work to you as you silently read the text, preferably from a paper copy. The computer will have a measured pace, which allows you to find double words, words that were left out, spacing issues and all sorts of other flaws that are easy for you to overlook while reading silently. The revision process is a necessary step for making your novel the best it can be. Hopefully these tips will help. Do you have any tips to make revising easier? If your choose, please share them.